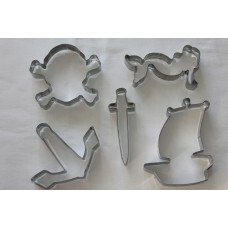 For your next pirate themed party try baking and decorating some delicious biscuits using this cookie cutter set. 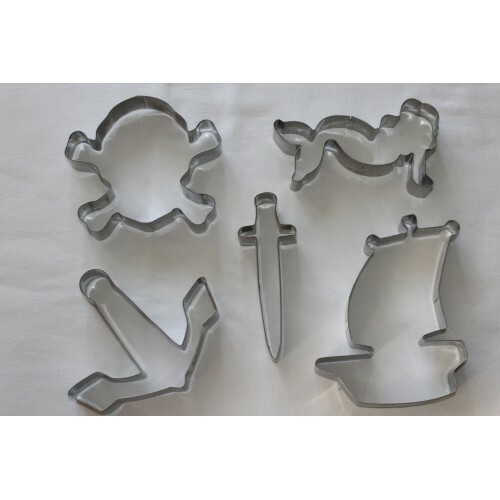 This 5 piece stainless steel cookie cutter set features a pirate ship (approx. 11cm W x 12.5cm L), skull and crossbones (approx. 11cm W x 10cm L), sword (approx. 4cm W x 11.5cm L ), mermaid (approx. 12cm W x 7cm L) and ships anchor (approx. 12cm W x 10cm L). These cookie cutters are made from stainless steel and are rust resistant. Also includes a basic cookie/biscuit recipe to use with your cookie cutters. The cookie cutters may also be used to cut fondant to decorate your pirate cup cakes or birthday cake. Just perfect for that Pirate themed birthday party. Pirate Cupcake Cases with 50 in a pack (me..
1 x sheet of temporary tattoos - sheet is perforated into 8 squares. Total of 16 tattoos (note:each ..